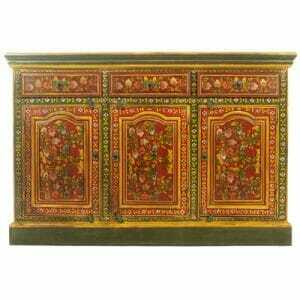 On these pages you’ll find our wide range of gorgeous, genuine Indian, hand-painted sideboards. 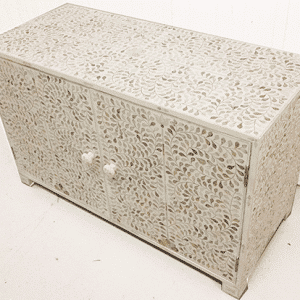 This exquisite line of furniture, like all of our authentic Indian furniture, handcrafted from start to finish following traditional practices of Indian woodcraft and artistic techniques. 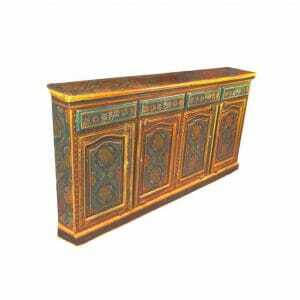 Expertly carved from environmentally sustainable Indian mango and sheesham wood, our painted sideboards can be ordered in a rich variety of styles, colours and designs that will breathe magic into your home. 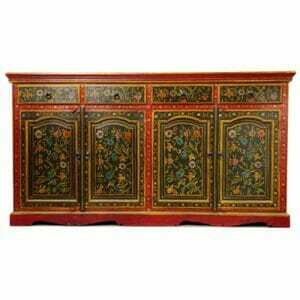 Why Pick Our Painted Indian Sideboards? 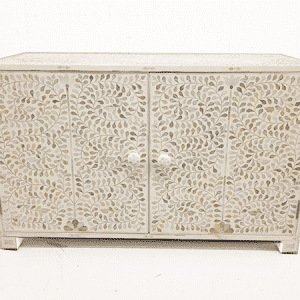 Our painted sideboards, like all of our fine Indian furniture, have been crafted and supplied following the highest standards of fair trade and environmental sustainability. 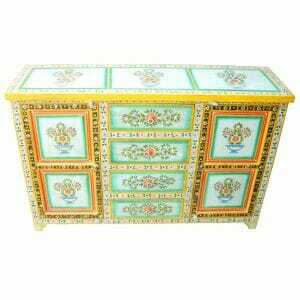 Invite the spirit of India into your life with Iris Furnishings’s beautiful hand painted furniture. 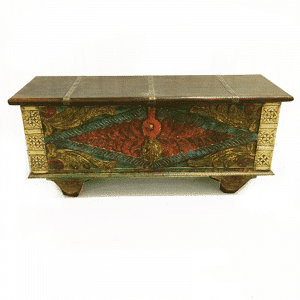 We’re delighted to offer for sale the finest selection of hand painted Indian furniture that can be found anywhere in Britain. 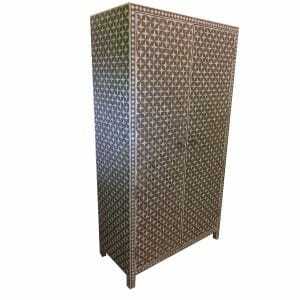 The rich colours, variety of authentic traditional patterns and the high standard of quality cannot be beaten! 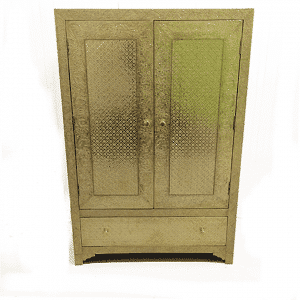 From our selection of bedside tables, intricately painted wardrobes and sideboards, you’ll be certain to find something you’ll fall in love with. 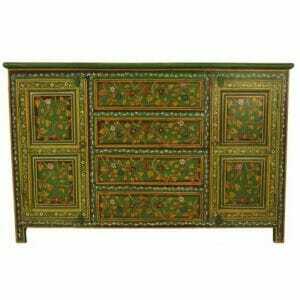 Our Indian sideboards have been painstakingly hand painted with intricate figures and details, transforming the unfinished Indian mango and sheesham wood into a true work of art. 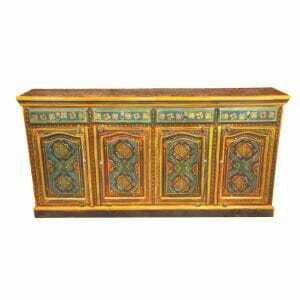 These sideboards can be purchased in an array of colours, patterns and styles, from four drawers flanked by a door on either side, to four doors with an upper drawer. 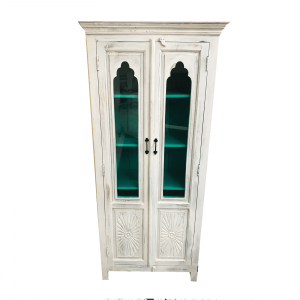 The variety of styles offers you a chance to find the perfect piece for your home, and each offers spacious storage for all of your needs. 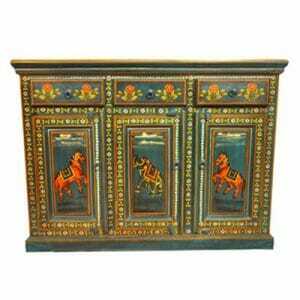 If you’re looking to spice up your style, consider our famous blue Ghora painted three-door sideboard featuring exquisite hand-painted elephants dancing against a blue background and surrounded by trailing flowers and vines. 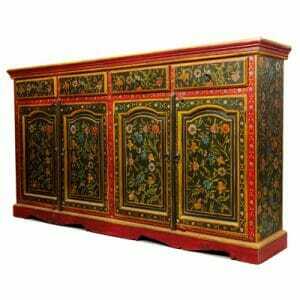 Our add depth and richness with our red painted four-door sideboard, which will add both luxury and immense storage space to your home. 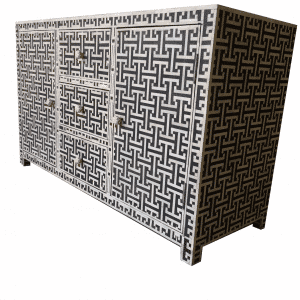 Why should a sideboard be boring? 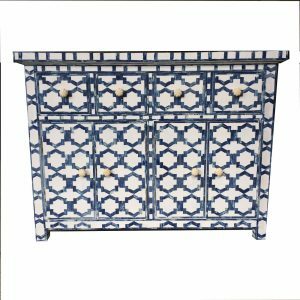 Whether you need a smaller piece or a large sideboard to maximise the space available, with our gorgeous painted sideboards you can combine both practicality and eye-catching beauty while adding the style and sophistication of India to your home. 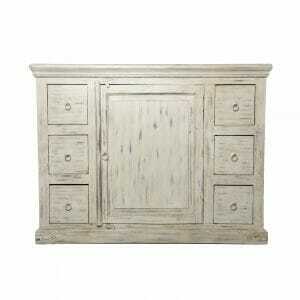 These gorgeous hand painted sideboards are both highly functional as well as beautiful. 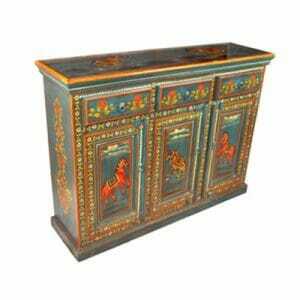 For a rich infusion of Indian design, consider our gorgeous blue Ghora painted sideboard. 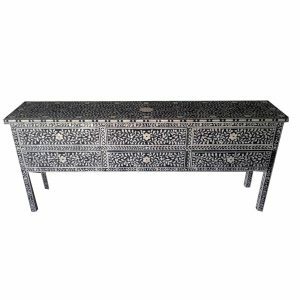 Featuring three doors and three drawers, this sideboard features intricate elephants and horses surrounded by floral and vine patterns on a blue background. This piece is sure to attract attention! 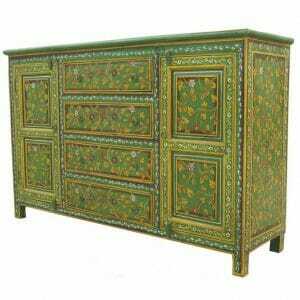 For an beautiful, complex piece, consider out blue and yellow painted sideboard. 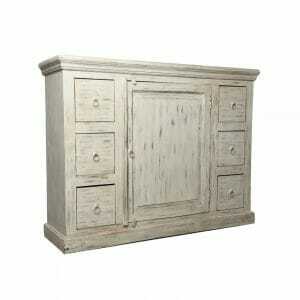 This large sideboard features four doors and four upper drawers, making it ideal for storing dishes or other items. 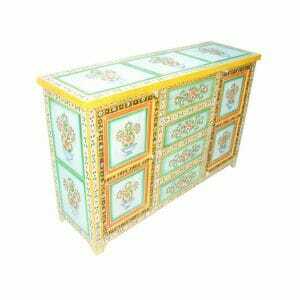 The bright blues and yellows mixed with geometric designs and traditional floral patterns create a stunning piece that will be the focal point of any room. 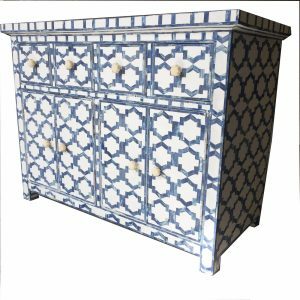 All of our hand painted furniture is crafted to the highest standards to ensure that it’s as durable as it is lovely to look at. 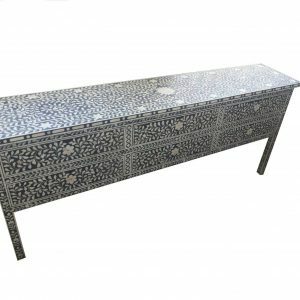 Each piece has been carefully carved and hand painted using the same techniques that have been used by Indian artisans for hundreds of years, so each item is one-of-a-kind – a true piece of Indian culture. 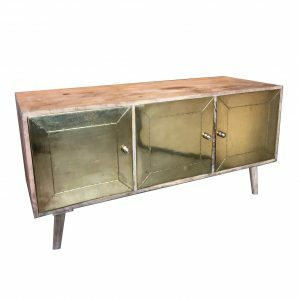 By purchasing one of these extraordinary sideboards, you’re helping to ensure that this famous Indian tradition of furniture-making lives on for a new generation. 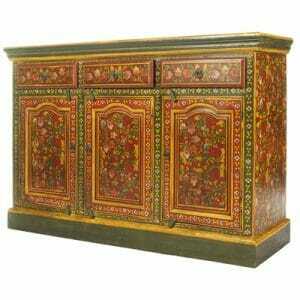 Our hand painted, authentic Indian sideboards come in such an impressive variety of beautiful colours, designs and styles that you’ll be sure to find one that perfectly fits your space. However, it’s possible that you want a specific combination of colours and style that we don’t currently have in stock – if so, do not hesitate to get in touch. 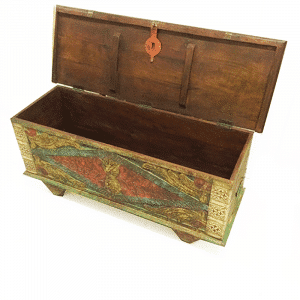 We’re more than happy to place a bespoke order for you to ensure you receive the perfect piece for your home. 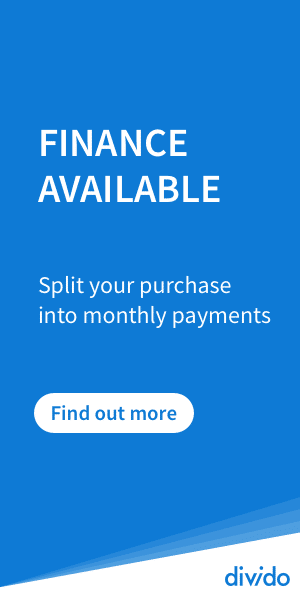 Simply let us know your requirements and we’ll soon draw up a free, no-obligation quotation. 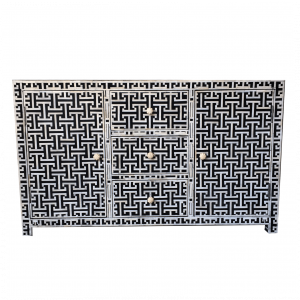 At Iris Furnishings, we stand by our commitments to fair trade and sustainability. 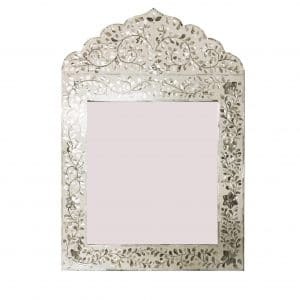 All of our craftsmen and suppliers receive a great deal in our transactions, which we personally guarantee by travelling regularly to Rajasthan where we visit our tradesmen in person. We also only purchase sustainably-grown mango and sheesham wood for all of our products so that each one of our pieces of furniture has the lowest possible environmental impact.